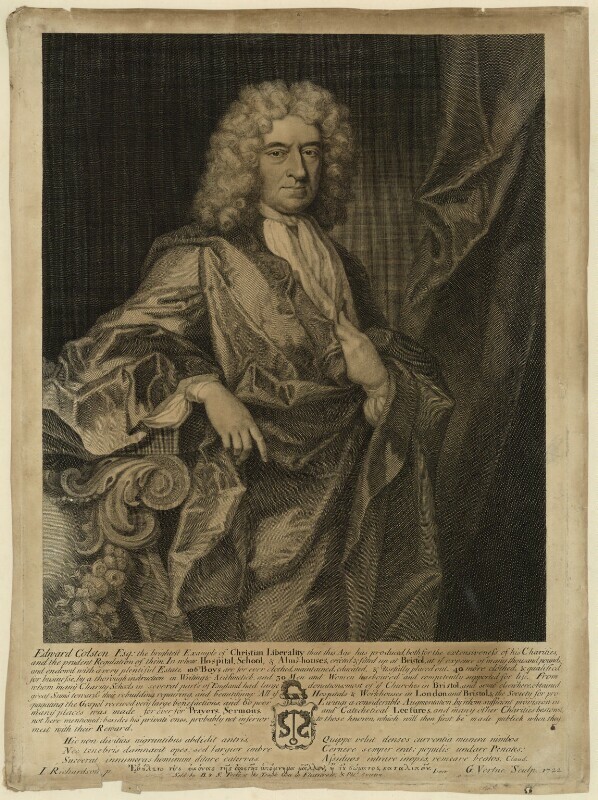 Edward Colston (1636-1721), Merchant and philanthropist. Sitter in 2 portraits. Atterbury Plot discovered; Francis Atterbury, Bishop of Rochester is accused of promoting the Jacobite rising. Other leading Jacobite sympathisers are also arrested and Atterbury is banished the following year. General Election is won by the Whigs. Daniel Defoe publishes his novel Moll Flanders which traces the redemption of Moll, a penitent prostitute, thief and American convict. Writer and politician Richard Steele premieres his play The Conscious Lovers at the Drury Lane Theatre, London to great acclaim. In sweeping reforms aimed at modernising Russia, Peter the Great introduces the Table of Ranks; a new meritocratic order of precedence which aims to break the power of the hereditary nobility. Dutch discover Easter Island, beginning a spate of European discovery in the islands of the Pacific. Iroquois League of Native Americans becomes known as the Six Nations, after the Tuscarora join the group.